As I mentioned in the Basics: Greens post ages ago, another food item I’ve missed being readily able to buy is dry-cured seasoning meat with the kind of cure I want. (Not usually so crazy about fatback.) You can find lots of bacon and other cured pork products here, both British and imported, but the cure is still just not quite what I’m looking for. (Still, better availability than in most of the US, with pretty good dry-cured bacon and pancetta in most supermarkets.) And a chunk of cured meat is better to throw in to season vegetables than bacon that’s been sliced thin for frying, to my taste. Old Waynesboro brand side meat, from MillRiverStore.com. I think I’ve actually bought some of that North Carolina brand before. I also didn’t know you could buy boiled peanuts in a can, before looking at that site, but they’re not really a thing back home anyway because peanuts don’t like the mountain climate. Now I’m oddly intrigued. At any rate, I had never tried curing meat at all before I got cravings for the “right” kind of seasoning meat. 🙂 This was a much less intimidating project than the hams I used to watch my grandfather cure sometimes, with trying to find a balance between not getting it oversalted so that you get crystals in the meat, and making sure you use enough that it doesn’t go bad next to the bone. It’s also less tricky than bacon you’re intending to slice up and fry without soaking, so I have been erring on the side of making it salty and dry. 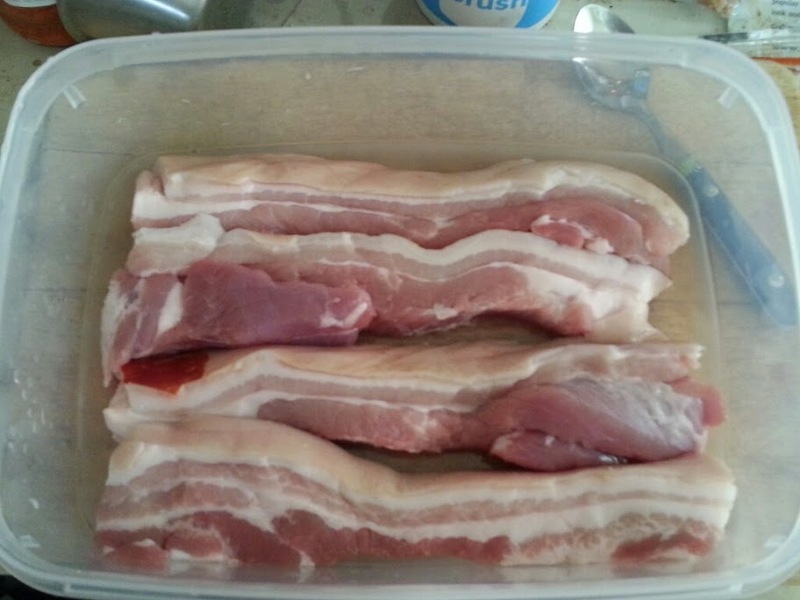 A good British step-by-step on dry-curing bacon. Also, the page I linked to earlier on dry-curing hams from Virginia Cooperative Extension, which goes into safety rather a lot. One I’ve been meaning to try, tasty as the commercial stuff is: Lap yuk 臘肉 – Chinese dried bacon, which also usually gets used to flavor vegetable dishes and the like. They also have interesting posts on making some other Chinese cured meats there. Also, for safety, while I’m thinking about it: you might want to use the ready-mixed curing salt intended for bacon. I already have pharmaceutical-grade potassium nitrate (saltpeter) on hand for aquarium plant fertilizing purposes, and feel OK using that–and guesstimating proportions to use by volume, erring on the low side. 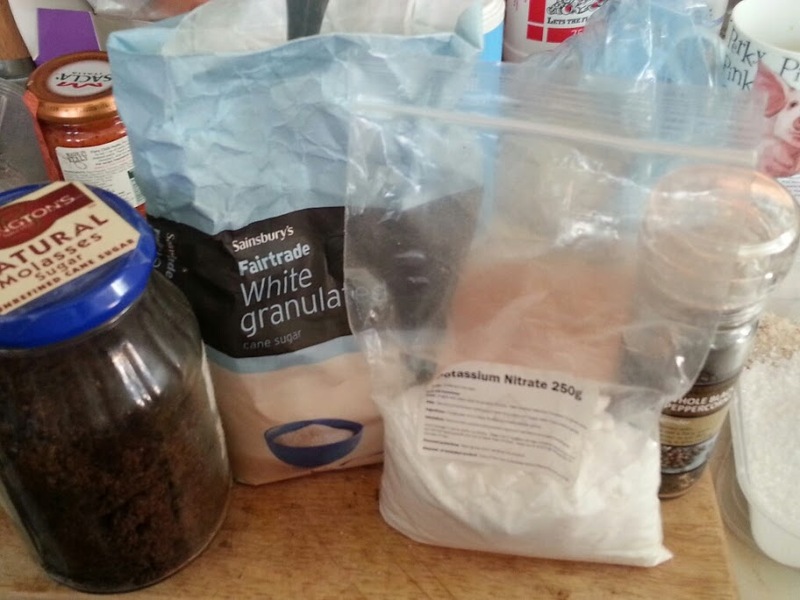 If you’re concerned about getting it wrong, it’s probably best to use the curing salt. Like with the brine pickles, the chances of making yourself sick are probably very, very low, but I still don’t want to encourage anybody to risk it! 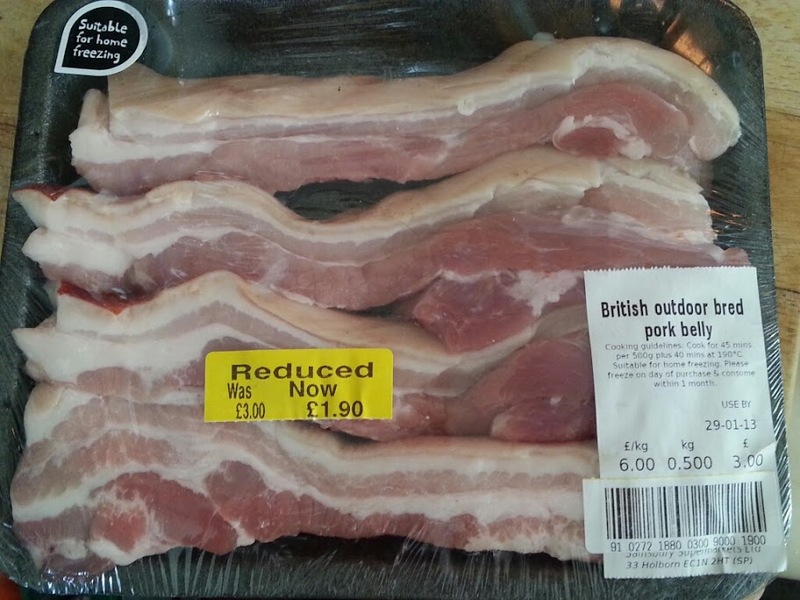 This was reduced, but it was still very fresh. The store-cut meat from our local Sainsbury’s tends to be good quality, in general. 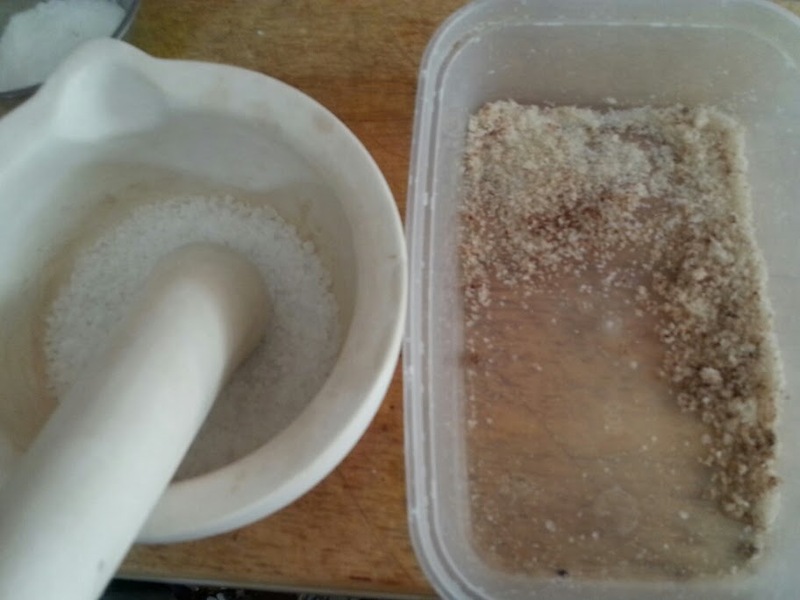 100mL/about 0.5 c. sea salt ground up some in a mortar and pestle, for extra flavor. 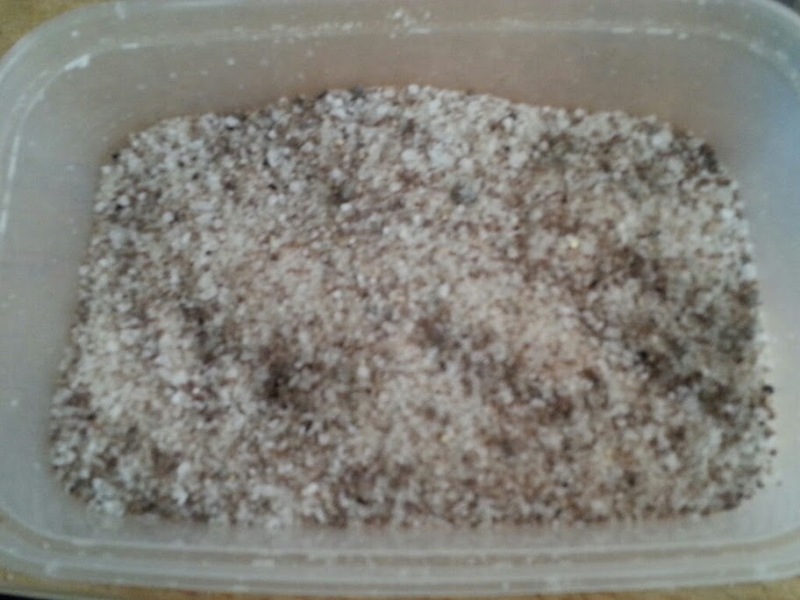 If you’re using regular table salt, it will pack down more and take a little less. All mixed up and ready to go, in an airtight storage container. This 2L container takes up a lot of space in our smallish fridge, but you want one that’s big enough to lay the meat flat in a single layer. Now, just sprinkle some of the cure on with a spoon (you don’t want to keep putting meaty hands back into the container! ), and rub it in well. You’ll want to use plenty of it to draw the moisture out. 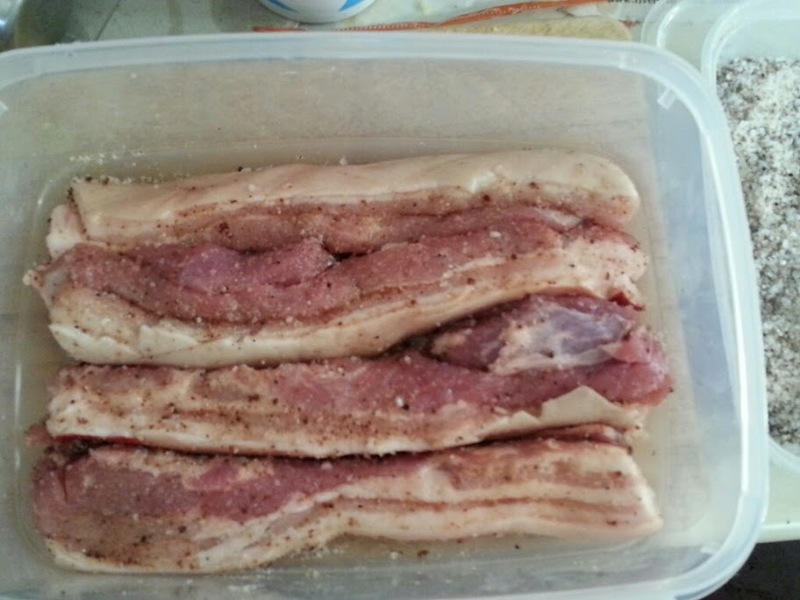 Make sure to get all the crevices, especially if the meat you bought was already slashed on the top fat for crispiness in cooking, like all the pork belly I’ve seen here. Now, without my hand blocking most of the view. Just a few minutes later, you can see how much moisture it’s already started to draw out of the meat. Yep, that’s some very brown sugar. Now it needs to go in the coldest part of your fridge, usually the bottom. 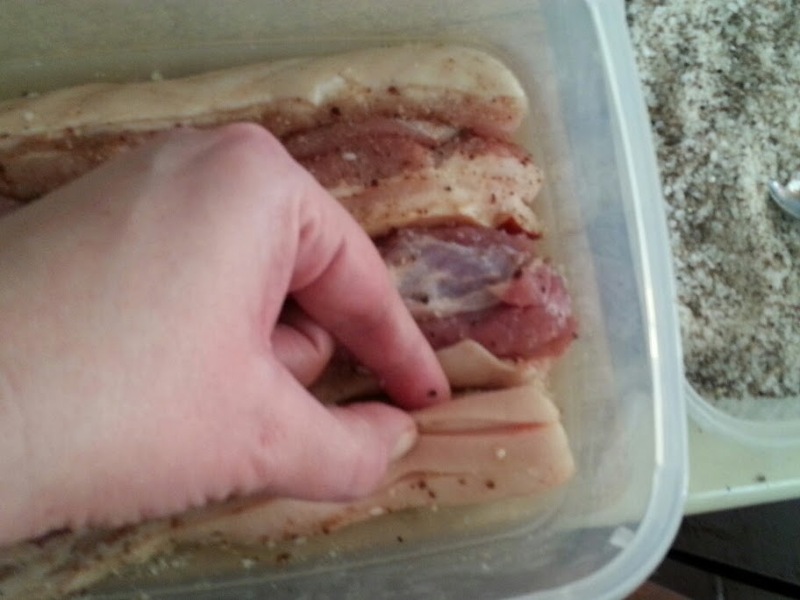 You’ll want to pull it out once a day for several days, to drain off the brine and salt it again with the curing mix. When it stops leaching out a bunch of moisture, it will be ready to wrap in cloth and hang to dry. No more batches than I’ve made so far, that time will vary quite a bit depending on the moisture in your meat starting out. As much lean as this particular pork belly has, it may take a week of daily draining and salting. I did consider waiting until it was done and doing a post then, but the last time I tried that it just never got written up. 😉 I will try to do some followups as it progresses. And once that’s done clunking up the fridge, I may try some corned beef or pork again. 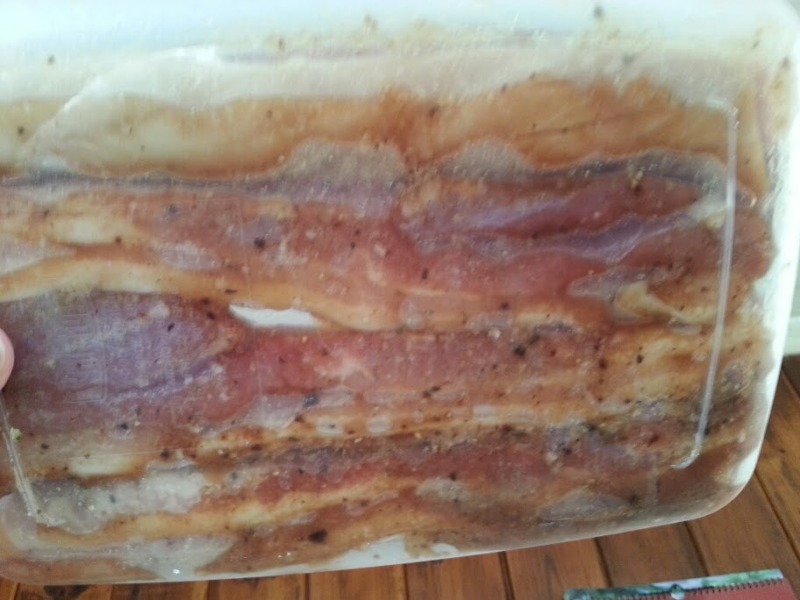 This entry was posted in Appalachian, Bacon, Basics, Curing meats, Dry cured, Meats, Techniques. Bookmark the permalink. Can I purchase Old Waynesboro meat on line? The Verdict is in: Non-Celiac Gluten Sensitivity? Hushpuppy Nation: Devoted to the history and culture of Southern food.